“FREE OF CHARGE” for all FHBC Voluntary Club Community Coaches!! When can you get involved? Pilot Course Delivery will start in February 2019. All stakeholder Clubs will be given the opportunity to participate in this program from March 2019. It is Field Hockey BC’s strategic desire to present opportunities within formal coach education that complement the National Coach Certification Program (NCCP) and align to the Long-Term Field Hockey Development framework (LTFHD). The Provincial Coach Education Pathway (PCE) is primarily targeted at voluntary club community coaches and places a greater emphasis on the technical and tactical building blocks for field hockey development. Each module is designed to be short in length (3 hours) allowing for a flexible approach to delivery. The mid-term goals are to utilize the PCE pathway as a catalyst for greater community engagement in coach education, to raise the value and consistency of coach delivery across the province, and to phase in mandatory standards for coach education over time. Field Hockey BC aims to deliver a first-class educational experience and in doing so enable community club coaches to deliver a consistent field hockey curriculum whilst raising the value associated with the athlete experience across the Province. The modular curriculum is designed to provide coaches with a foundation for technical and tactical learning that is tailored to each stage of Long-Term Athlete Development (LTAD). Such a foundation allows coaches to evolve and adapt practice and game based learning according to the needs of an athlete group. KPI (Years 1-3): Progressive investment in training, education, and professional development for and of facilitators and facilitator evaluators – target numbers and opportunities set on an annual basis – expectation for renewal of facilitator numbers is on a two-year cycle. Field Hockey BC recognizes that both time commitment and financial constraint continue to be a significant barrier to coach involvement in formal education, especially at the club community level. The Provincial Coach Education (PCE) Pathway has been designed to deliver a core-curriculum in as flexible and concise a format as possible allowing for community clubs to decide the most efficient manner with which to deliver the program. In addition, Field Hockey BC has made the financial commitment for both 2019 and 2020 to absorb all associated delivery costs for the PCE Pathway – all modular courses will be offered ‘free of charge’ to PCE candidates for a two-year period. For those candidates wishing to access the National Coach Certification Program (NCCP), Field Hockey BC has also made the financial commitment to subsidize 50% of the associated course delivery costs throughout 2019, 2020, and 2021. In 2021, Field Hockey BC intends to phase in Mandatory Requirements for formal Coach Education. Minimum mandatory requirements will target the PCE Pathway in 2021 with all coaches in the Province required to attain ‘Trained’ status at the appropriate LTAD stage of learning (the LTAD stage of learning a coach is operational within in that season). It should be noted that ‘Trained’ status within the NCCP pathway is considered a higher level of formal qualification than that of the PCE Pathway. KPI (Year 3): Funding provision to allow for transition to Mandatory Status requiring all coaches to attain a minimum of Provincial Coach Education (PCE) Pathway ‘Trained’ status within the appropriate LTAD stage of learning. Field Hockey BC aims to evolve the PCE Pathway content material in line with the development of field hockey at both a global and domestic level. Over time the desire is for the PCE Pathway to both look and feel like a tailored British Columbia and Canadian field hockey resource and be available to access in multiple formats. KPI (Year 3): To plan for the transition of course material and modular delivery to an online education platform. 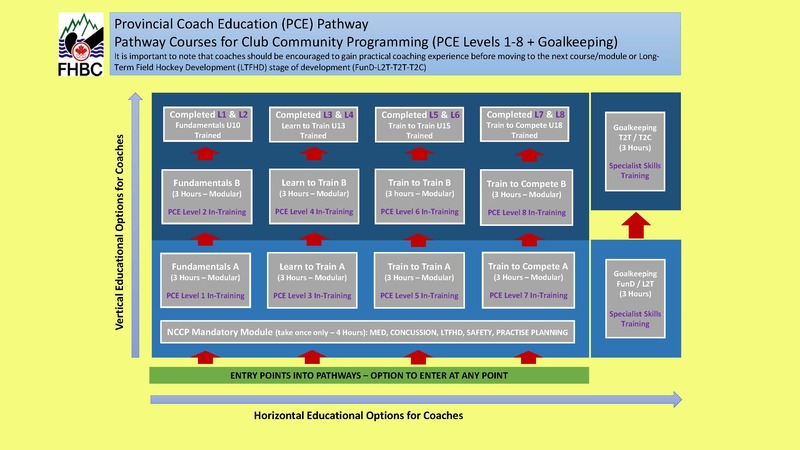 Check out the full PCE Pathway Overview for a more details!